Every successful player in Africa’s local football leagues in the 21st century eagerly grabs the opportunity to play professional football in other continents of the world. Former Enyimba Captain, Mfon Udoh is arguably Nigeria Professional Football League’s (NPFL) most successful striker. In the 2013/2014 NPFL season, the 26-year-old deservedly grabbed a majority of the League’s individual awards after scoring a record 23 goals for the People’s Elephant of Aba. He received the golden boot for NPFL Top Scorer, the award for NPFL Player of the season and the League Bloggers Player of the season. The former Calabar Rovers talisman was nominated for the award of CAF African Footballer of the Year at the end of the year, after emerging the highest goal scorer in Enyimba’s CAF Champions League campaign in 2016 despite battling with injury and lack of playing time under the reign of new coach, Paul Aigbogun. With all the success, Mfon Udoh is yet to play outside the shores of Nigeria and critics in some quarters have at times referred to The Promise Keeper’s new goal poacher as a “local champion”. But Mfon doesn’t seem perturbed at all. 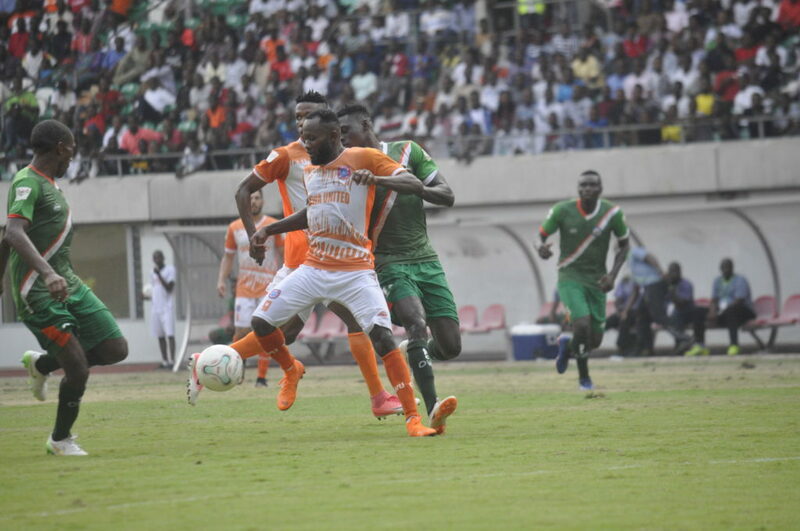 Speaking to journalists after scoring a vital goal for Akwa United at the August 27 Stadium against Yobe Desert Stars, the twice-capped Nigerian international believes his chance to play abroad will come someday when the question was raised. “Let me take it Biblical. The race is not for the swift, riches are not for the men of intelligence,” making an allusion from the Holy Book of Christians, the Bible (Ecle 9:11). “You know its football, it’s time and chance, and it doesn’t mean that people abroad are better than people at home, they are lucky, they had a deal and everything worked out. “With time, we are still going to do it [play abroad], we are still going to prove to them that we are not only local champions, that we can still make it abroad,” he said. This season alone, Mfon has directly contributed to approximately 40 percent of points amassed by the 2017 Aiteo Cup Champions. A brace in the club’s 2-2 draw against Plateau United in Uyo and a header on Matchday 7 against Yobe Desert Stars in Damaturu. After amassing a total of 58 goals since his emergence into the elite Nigerian League from Nigerian National League side, Calabar Rovers [Akwa United (2012/2013) – 16 goals, Enyimba (2013 – 2018) – 39 goals, Akwa United (2019) – 3 goals], helping Akwa United win her maiden NPFL title is more a priority to Mfon than becoming a two-time highest goal scorer in the NPFL. “My concern is to help Akwa United win the league which they have not won before, so that’s my real priority, not being the highest goal scorer but if it comes, I’ll take it,” he added. Akwa United welcome League newbies, Kada City to the Nest of Champions on Matchday 8 as Mfon Udoh hopes to keep his promise to The Promise Keepers who are yet to lift an NPFL trophy since their promotion to Nigeria’s top-tier league in 2006.